Orderliness is considered one of the most important signs of professionalism. Especially in the Catering Industry, an orderly refrigerator exudes trust, credibility, and is adding to the positive aspects of a business, while being directly linked with quality services & products. Other than professionalism, the loading of a cooling area is definitive for the proper operation of the refrigerator and for its longevity, as well as for the hygiene of the food that is stored in the appliance. How should we load a refrigerator? Problem-free air circulation within the refrigerator is important for the proper cooling of a refrigerator’s interior. Much depends on this. Thus, it is of vital importance that air is not obstructed by boxes, utensils, etc. The products are placed in special containers. 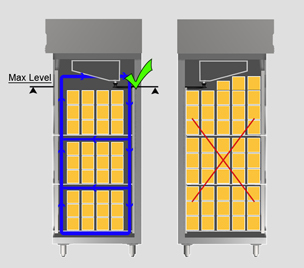 The products should not exceed the maximum storage level. The products are always placed on the shelves. The products are placed within the surface defined by the shelves. The products do not touch the appliance walls. Air-flow from the evaporator’s ventilator is unobstructed. The products are placed without protection. The products exceed the maximum storage level. The products protrude from the surface of the shelves. The products touch the appliance’s walls and floor. Air-flow from the evaporator’s ventilator is obstructed. PreviousPrevious post:7 Tips to Prolong the Life-Cycle of your Appliance!NextNext post:Multi & Remote Unit Refrigerators: Gains on “Multi”-ple levels!